Heat and humidity are back, along with my salad cravings. 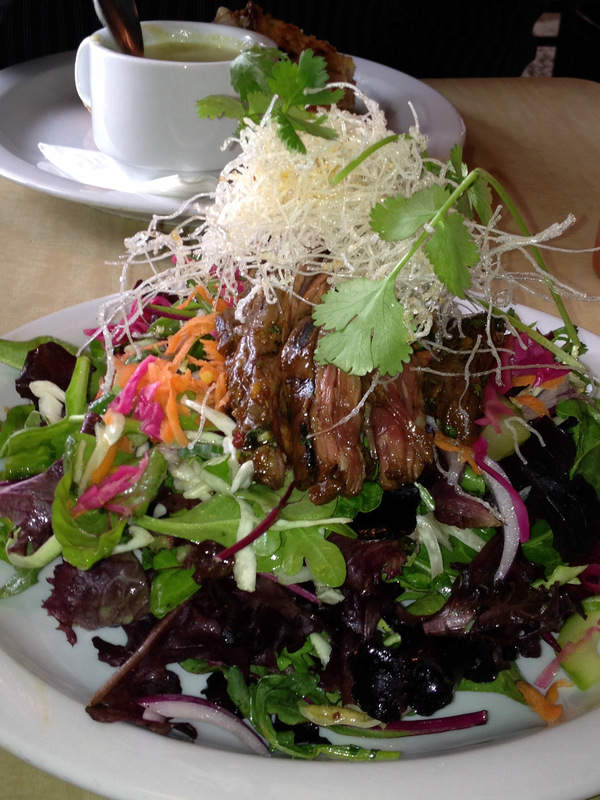 Last week, Cowbell (8801 Oak Street, New Orleans, LA) managed to make the salad lover and the carnivore happy in a single dish: grilled thai beef salad. Pristine baby greens (red leaf, oak leaf, arugula, spinach, radicchio, frisee) cradled thinly sliced, juicy strips of grassfed beef, crowned with a a tangle of puffed noodles, red onions, cucumbers, pickled carrots and cabbage, and cilantro. Judiciously applied ginger-shallot vinaigrette tied it all together. Cowbell’s menu-standard grilled chicken & arugula salad (with goat cheese, toasted pecans and a sherry dressing) is worth a mention, but the daily special salads shine. Yesterday brought a turkey cobb with bacon and blue cheese….who knows what tomorrow holds? “Like” Cowbell on Facebook to see each day’s specials.